What is New in Zoner Photo Studio 10? A Browser facelift, ?Vista style? (e.g. jumbo icons, headers, and highlighting). Previewless filter windows ?you can now use the main Editor window for previewing your work with filters. HDR (High Dynamic Range) photo composition?combining shots with a wide exposure range (?sandwiching?). Gradient Filter tool - a software version of the physical gradient filters that one can use across a camera lens. Effect Brush in the Editor - ?brush on? changes to brightness, contrast, saturation, and sharpness. The Editor?s retouching tools now support pressure-sensitive tablets. Variations filter ?help you review several results at once when changing brightness and color tones. Automatic picture comparison ?viewing of details on multiple photos at the same time (a ?light table?). Switched to Unicode encoding for data both within metadata (XMP) and for display in the program. Location item added for IPTC picture information. Display and reading of locations supported directly within OziExplorer map software. You can now run photo searches and filtering by the distance from a selected location or reference photo. popular Pan and Zoom effect. Import of Ogg Vorbis audio files. Full-featured conversion of files from most RAW formats with support for an external DNG convertor. A new method of connecting to DCRaw. Support for the Mamiya (MEF) and Epson Raw File (ERF) format. Conversion to Web JPEG with a control for maximum output file size. 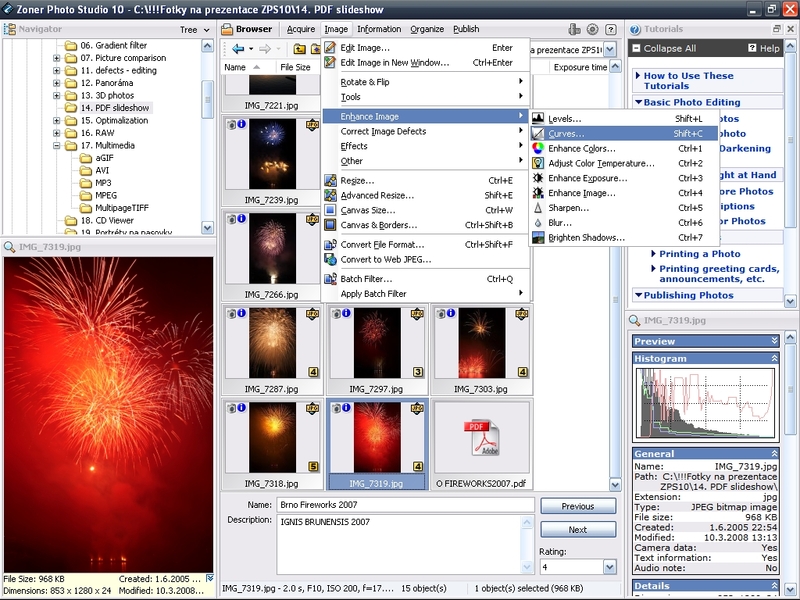 New HD Photo (Windows Media Photo) format and loading of PNM, PPM, PAM, PBM, PGM (?Unix? formats), Adobe PhotoShop?s PSB format and WBMP (?wireless? application format).